The Sea of Galilee is Israel's largest freshwater lake, approximately 53 kilometers (33 miles) in circumference, about 21 km (13 miles) long, and 13 km (8 miles) wide; it has a total area of 166 km², and a maximum depth of approximately 43 meters. At 209 meters below sea level, it is the lowest freshwater lake on Earth and the second-lowest lake in the world after the Dead Sea, a saltwater lake. It is not a sea by any normal definition; it is called a sea by tradition. 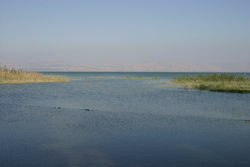 The lake is also known on modern maps as Lake Galilee or Lake Tiberias. 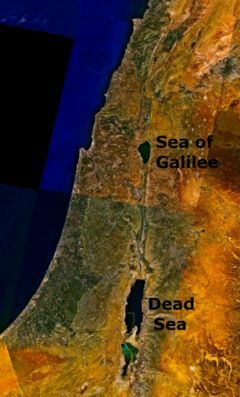 The name Galilee refers to the region of Galilee in which it is located. In modern Hebrew it is known by its biblical name, Yam Kinneret (ים כנרת), "Sea of Kinnereth" (Numbers 34:11; Joshua 13:27). The name may originate from the Hebrew word kinnor ("harp" or "lyre") - which the lake's shape resembles. It has also been called the Lake of Gennesaret or the Sea of Gennesaret ( Luke 5:1) after the name of a small fruitful plain which lies on its western side. The Arabic name for the lake is Buhairet Tabariyya (بحيرة طبريا) meaning Lake Tiberias. Other names of the Sea of Galilee: Ginnosar, Lake of Gennesar, Sea of Chinneroth, Sea of Tiberias (Roman) and Waters of Gennesaret. The Kinneret is fed by underground springs, but its main source is the Jordan River, which flows through it from north to south. The lake is situated deep in the Jordan Great Rift Valley, the valley caused by the separation of the African and Arabian Plates. Consequently the area is subject to earthquakes and, in the past, volcanic activity. This is evidenced by the abundant basalt and other igneous rock that define the geology of the Sea of Galilee region. Due to its low-lying position in the rift valley, surrounded by hills, the sea is prone to sudden violent storms; hence the New Testament story about Jesus calming the storm. Indeed, the main feature of the lake seems to be its ever-changing character. It is still noted, as in New Testament times, for its rich fish stocks, and in today's restaurants, "St. Peter's Fish" ( tilapia) is very popular. 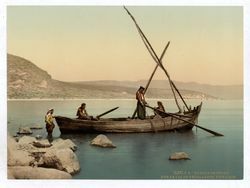 The Sea of Galilee lies on the ancient Via Maris which linked Egypt with the northern empires. The Greeks, Hasmoneans, and Romans founded flourishing towns and settlements here: Gadara, Hippos, Tiberias and others. The first-century historian Flavius Josephus was so impressed by the area that he wrote, "One may call this place the ambition of Nature." Josephus also reported a thriving fishing industry at this time, with 230 boats regularly working in the lake. Much of the ministry of Jesus occurred on the shores of Lake Galilee. In those days, there was a continuous ribbon development of settlements and villages around the lake and plenty of trade and ferrying by boat. The Synoptic gospels of Mark (1:14-20), Matthew (4:18-22), and Luke (5:1-11) describe how Jesus recruited four of his apostles from the shores of Lake Galilee: the fishermen Simon and his brother Andrew and the brothers John and James. One of Jesus' famous teaching episodes, the Sermon on the Mount, was given on a hill overlooking the lake. Many of his miracles were also recorded to occur here: his walking on water, calming a storm, feeding five thousand people (in Tabgha), and many others. In 135, the second Jewish revolt against the Romans, called Bar Kokhba's revolt, was put down. The Romans responded by banning all Jews from Jerusalem. The centre of Jewish culture and learning shifted to the region of the Kinneret, particularly the city of Tiberias. It was in this region that the so-called " Jerusalem Talmud" was probably compiled. In the time of the Byzantine Empire, the lake's significance in Jesus' life made it a major destination for Christian pilgrims. This led to the growth of a full-fledged tourist industry, complete with package tours and plenty of comfortable inns. Political map of the Sea of Galilee region today. The lake's importance declined when the Byzantines lost control of it. The area came under the control of the Umayyad Caliphate and subsequent Islamic empires. Except for Tiberias, the major towns and cities were gradually abandoned. In 1187, Saladin defeated the armies of the Crusades at the Battle of Hattin, largely because he was able to cut the Crusaders off from the valuable fresh water of the Sea of Galilee. In 1909 Jewish pioneers built their first cooperative farming village ( kibbutz), Kvutzat Kinneret which trained Jewish immigrants in farming and agriculture. Later, Kinneret pioneers established Kibbutz Degania. Kinneret was the cradle of the Kibbutz culture of early Zionism and was the birthplace of Naomi Shemer and the burial site of Rachel - two of the most prominent Israeli poets. In 1923 an agreement between the United Kingdom and France established the border between the British Mandate of Palestine and the French Mandate of Syria. The British handed over the southern Golan Heights to the French in return for the northern Jordan Valley. The border was re-drawn so that both sides of the Jordan river and the whole of the Sea of Galilee, including a 10-meter wide strip along the northeastern shore, were made a part of Palestine . The 1947 UN Partition Plan put this territory area inside the Jewish state. 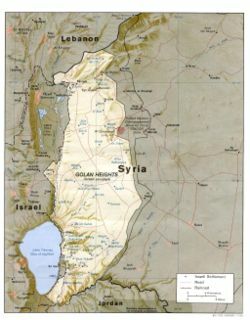 During the 1948 Arab-Israeli War, Syria occupied the lake's northeastern shore. This map illustrates the border lines and the Demilitarized Zones at the time the 1949 Armistice Agreements were signed. In 1967, the State of Israel took control of the entire Sea of Galilee as well as the Golan during the Six Day War. Syria still claims the northeastern shore of the sea , arguing it is a part of the Golan Heights. Israel's National Water Carrier, built in 1964, transports water from the lake to the population centers of Israel, and is the source of most of the country's drinking water. Israel also supplies water from the lake to the West Bank and to Jordan (under the terms of the Israel-Jordan Treaty of Peace). Increasing water demand and some dry winters have resulted in stress on the lake and a decreasing water line, at times to dangerously low levels. Today, tourism is again the Kinneret's most important economic activity. The entire Sea of Galilee is a popular holiday resort area. The many historical and spiritual sites around the lake, especially its main town Tiberias, are visited by millions of local and foreign tourists annually. Other economic activities include fishing in the lake and agriculture, particularly bananas, in the fertile belt of land surrounding it.